A number of the West Midlands&apos; Labour politicians have come out to say that a new leader is needed, as the party embarks on a divisive leadership contest. Steve McCabe, MP for Birmingham Selly Oak, claimed that Jeremy Corbyn was leading the party "over a cliff", while Jack Dromey, Labour MP for Birmingham Erdington, said the party was heading for a "crushing defeat" under Mr Corbyn&apos;s leadership. And Khalid Mahmood, Labour MP for Birmingham Perry Barr, said the party was letting down millions who needed its help. They spoke after former shadow business secretary Angela Eagle and former shadow work and pensions secretary Owen Smith both announced they were challenging Mr Corbyn for the party leadership. And Labour&apos;s battle began after the Conservative leadership contest finished early - with Theresa May, the former home secretary, being crowned Prime Minister. Steve McCabe said: "I have come to the conclusion Jeremy is a loser and he is going to destroy the Labour Party. "That&apos;s a terrible conclusion to come to but I have spent the best part of a year trying to work with the new regime and I just don&apos;t think it is taking us anywhere other than over a cliff." He had not yet decided which of the rival candidates to support, he said. Mr Dromey said: "I was born on the left and I will die on the left. I want to see a left future for Birmingham and Britain. "But there is no future for the Labour Party if, led by Jeremy, we go down to a crushing defeat in an early General Election. "That would be to let down those we represent. Erdington is rich in talent but it is one of the poorest constituencies in Britain. It badly needs a Labour government." And Khalid Mahmood said Labour needed a new leader. He said: "It is important that we look at making the party electable." Opinion polls suggested Labour had no chance of winning a general election, he said. "We are still eight points behind at this point, which is not the right place to be at all. The people we are meant to represent have suffered hugely under this government. There are huge problems with the bedroom tax, with the austerity this government has imposed. "It can&apos;t be just about people who paid to take part in the leadership election. It&apos;s about the millions of people who need a Labour government." Mr Corbyn will take part in a new Labour leadership contest - and anyone can vote for a fee of £25, Labour&apos;s National Executive Committee has confirmed. This is the cost of becoming a "registered supporter" allowing people to take part in the ballot. They also have to confirm that they support Labour&apos;s "aims and values". The £25 fee is much higher than the £3 charged to take part in the 2015 contest when Mr Corbyn was first elected as Labour leader. And the increase was seen by some as an attempt to make it harder for supporters of Mr Corbyn to take part. Party members can also take part in the contest but only if they joined on or before January 12 this year. There was good news for the Labour leader, after the party&apos;s ruling National Executive Committee ruled he would automatically be included in the ballot. His opponents in the party, who want him gone as leader, had argued that under party rules he needed to be nominated by 51 Labour MPs and MEPs to stand again. If Labour&apos;s ruling body had agreed, Mr Corbyn might have found himself excluded from the contest - effectively sacked as leader - because he would be unlikely to find enough MPs willing to support him. A contest is taking place after Black Country MP Tom Watson (Lab West Bromwich East), and the party&apos;s deputy leader, was unsuccessful in his attempt to negotiate a deal which could have involved Mr Corbyn standing down voluntarily. Ms Eagle said: "I&apos;m glad Labour&apos;s NEC has come to a decision. I welcome the contest ahead. And I am determined to win it." 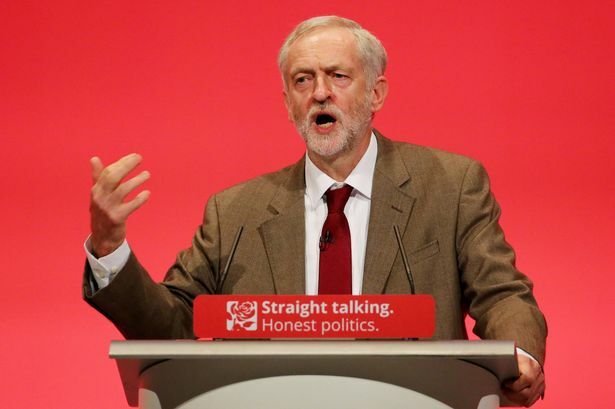 Mr Corbyn said in a video statement: "It&apos;s about the future of this country. The next government will be a Labour government." Mr Smith is standing on a platform to the left of Ms Eagle but not as left wing as Mr Corbyn.